Professional poker player Eric Froehlich was born in 1984 in New Jersey and his nickname is Efro. He is a skilled, educated, and young poker player with a bright future. When Eric was in high school he began to learn to play the game of poker, and was a quick learner. He played poker online and offline and won quite often. Eric was always playing some type of game and was always competitive. He was an athlete in high school until he was injured. After the injury he began to play magic, which he became the number one Magic player in 2002. He went to the University of Virginia but Eric decided to pursue his career in professional poker. 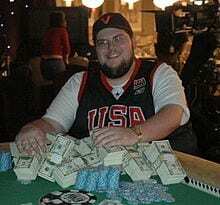 In approximately 2005 Eric was 21 years old and was finally qualified to play in the World Series Of Poker. His 2005 debut certainly was eventful and left an impression with the best poker players in the world and the poker fans. Eric won a fifteen hundred dollar limit Holdem event bracelet rewarding his over three hundred thousand dollar victory, which made him one of the youngest bracelet winner at that time. In 2006 he won another bracelet, this time for a pot limit Omaha event. He took home almost three hundred thousand dollars in this 2006 event.